Today I would like to review another book in my Christian Childrenâs Book Reviews Series. Todayâs Christian Childrenâs book review is the second book in the Bible Bellesâ The Adventures of Rooney Cruz series. 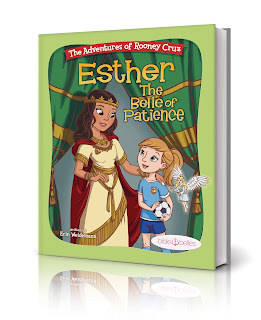 The second book in this series highlights the story of Esther, the Belle of Patience. (The first book covered Hannah,the Belle of Prayer). The thing I like about this series is that it is designed to teach young girls about inner beauty using prominent Bible characters and real life problems. This book is excellent at modeling how the Bible can be applied to our lives today. However, I have a few concerns with this book. I found this book to be a little long and it blurred the lines between fact and fiction. The way the angels were depicted in this book reminds me of fairies. While I realize little girls love fairies, I donât the Bible describes angles as fairy like creatures. The book also described Esther as having a âsuperpower.â The story then goes on to have the angel give the main character of the story a bell to symbolize the main character receiving the âsuperpowerâ of patience. Given these concerns, I recommend this book being used to help children discern truth from fiction. One game I like to play with the little people in my life is can you spot the almost truth. Basically, as I read story I sometimes add âalmost truthsâ to the story. It is the childâs job to spot the almost truth. This little game keeps children engage when you are reading a story to a group. Well that is all for now, please continue to pray for me and know I am praying for you. Disclosure (in accordance with the FTCâs 16 CFR, Part 255: âGuides Concerning the Use of Endorsements and Testimonials in Advertisingâ): Many thanks to Propeller Consulting, LLC for providing this prize for the giveaway. Choice of winners and opinions are 100% my own and NOT influenced by monetary compensation. I did receive a sample of the product in exchange for this review and post. I am trying to teach my grandchildren, I try to teach them by showing them.